Skipper Tom Heaton is more determined than ever to guide the Clarets back to the Premier League. Sean Dyche’s side are currently fifth in the Championship, five points adrift of Middlesbrough in the division’s automatic promotion spot and an identically tally clear of Cardiff City who occupy sixth place. I still think there’s a lot more we can bring to the party! The goalkeeper, who has earned four successive call-ups to Roy Hodgson’s England side, was handed the captain’s armband in the summer following the acrimonious departure of defender Jason Shackell to Derby County. “It’s been great, I’ve really enjoyed it,” said Heaton, who signed a new contract in pre-season to keep him at the club until 2018. “The great thing is we’ve got a fantastic dressing room, there’s a great atmosphere and a great culture among the squad so there’s not an awful lot to do in that sense. “I’m trying to just ease into it really, nothing’s really changed. Obviously the focus is still on performing from my point of view, making sure that’s right, and then just trying to add little things in and try to push the boundaries like that. Heaton added: “It would be incredible (to captain the club to promotion). That’s certainly the aim, and the ambition. I think we’ve got more than enough quality and more than enough about us to do that. “We’re in a great situation at the minute and we still think there’s more to come which can only benefit us really. 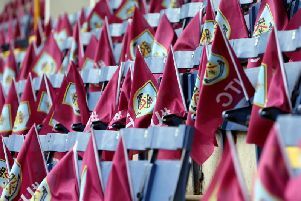 The Clarets had been looking to take their unbeaten run in to double figures ahead of the Lancashire derby with Preston North End at Turf Moor but goals from Will Keane and Daniel Johnson inflicted a third defeat of the campaign. However, Heaton is still optimistic about the start that the Clarets have made this term. “We’ve started the season very well,” he said. “We’ve been churning results out over the vast amount of games there are. “I still think there’s more to come and I think that’s the great thing about this team at the minute. He added: “You’re not going to get it all your own way all the time, the important thing is over a period of time that you’re doing the right thing more often than not, and that brings the results you require.